The holidays are rapidly approaching, and it’s time to think about gifts. Grandparents, aunts, and uncles are notoriously hard to shop for. They are like teachers: they get a lot of things, but they really want something heartfelt. They are the perfect people to be recipients of your children’s special, handmade gifts. If you’re anything like me, the thought of helping your children make a gift makes you sick. As much as my kids want to do it on their own, my perfectionism takes over and then the fun is completely gone. So I’ve put together some ideas for crafts that your children can make almost completely on their own. You may have to do a little prep work for the younger kids and maybe supervise a bit and/or clean up afterward, but ultimately your kids will be able to make these themselves. For preschool-aged kiddos, these three ideas are absolutely perfect. They can be done in a few minutes or be stretched into longer time periods. They can also be done almost anywhere, including while strapped into a high chair or while Solo Moms are doing any of the millions of things they are trying to accomplish. Cookie plates. Kids under the age of five can’t bake their own cookies, but they can create a beautiful plate to serve them on. Have them practice their lacing skills by threading colorful and festive ribbon through the edges of a paper plate and then aid them in tying it off in a bow. Prep work is required here for you, Solo Mom (or big sibling), but punching holes in the plates can easily be accomplished while watching The Crown and drinking wine. Personalized wrapping paper. This is one of my favorites. Purchase a roll of plain paper for wrapping, or recycle your collection of paper shopping bags and let your children go wild decorating the paper with markers, crayons, stencils, and paint (if you’re brave). Then when they’re done, use it to wrap up Grandma’s gifts. Pipe-cleaner candy canes. This is another great “busy bag” project that can buy the Solo Mom some quiet time in the grocery store or at the doctor’s office, or while cooking dinner. With pipe cleaners and beads, the little artist is all set. Real candy canes come in all colors and designs, and even fun shapes and sizes, so the possibilities are endless. These can be gifted as ornaments or attached to other wrapped gifts. As the kids start mastering those fine motor skills in kindergarten and beyond, they are capable of far more than we give them credit for. They like mixing, pouring, and creating, and we are almost ready to give them free range to do so. These ideas are the perfect mix of controlled freedom. Hot chocolate in mason jars. This gift is great for those who want to help in the kitchen but aren’t quite old enough for heating up things on their own. Have them pour dry hot-chocolate mix—either from individual packets or, if they are old enough to measure, from a larger container—into four-ounce mason jars. Then they can add a layer of marshmallows, maybe a Hershey’s Kiss, or even a tiny candy cane. Melted-snowman ornament. 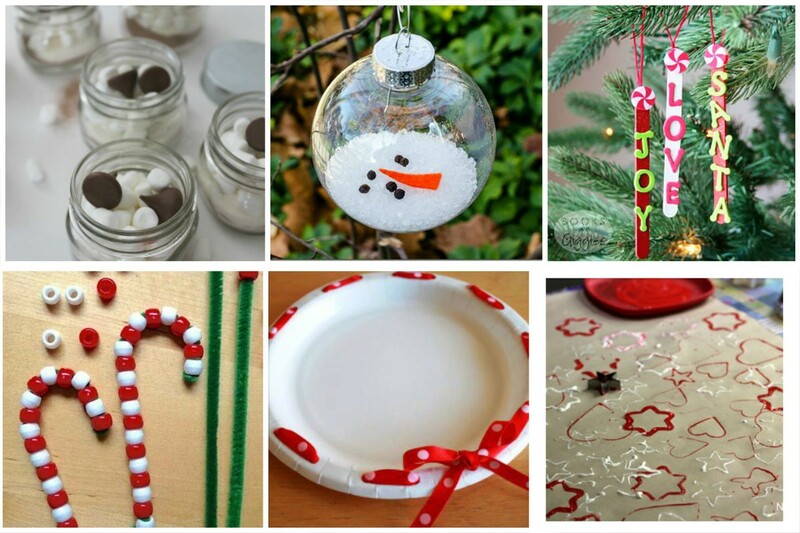 Ornaments are fun, but these are a blast to make, especially if you live in a warmer state. In an empty (plastic! ), clear ornament container, have the kids add some Epsom salt, a small piece of orange felt, and some black beads or peppercorns and voilà: a melted snowman. Popsicle-stick ornaments . . . or bookmarks or people or anything, really. Creativity is key with this craft. Markers, crayons, and paint serve as the base for the project. Then children can add letter stickers, construction-paper hats, cotton balls, etc. Anything goes here. Ribbon glued to the back of the sticks can make them into ornaments. A magnet on the back makes them easy to put on the fridge. These are incredibly versatile and can be made one at a time or in batches. The main thing Solo Moms need to keep in mind during this holiday construction period is that these are not your projects; they are your child’s. It is your child’s gift to give, and his or her personality will shine through—and the recipient will love it, no matter what. Encourage your child to share the story of his or her creation with the recipient. Remember the macaroni necklace you still have in your bedroom? Remember how excited your child was to show it to you and tell you all about it? The necklace reminds you of that story and childhood excitement. Homemade gifts such as the ones listed above will do the same for someone else. Nothing store bought will ever mean more.